We are all aware of the phenomenon of the pushy parent in sport. A child blessed with unusual talent who achieves great things at an early age but who is forced into a tough regime by an ambitious mother or father who is in some sense trying to live their own dreams through the career of their child. Whilst we see small scale images of these figures at many an under 8 football match in the park, it seems to be more evident in individual sports and there have been a number of high profile examples in the world of tennis. In some cases this early pressure is the main reason why the child achieves success, but there are other examples of early burnout and resentment of the domineering parent. 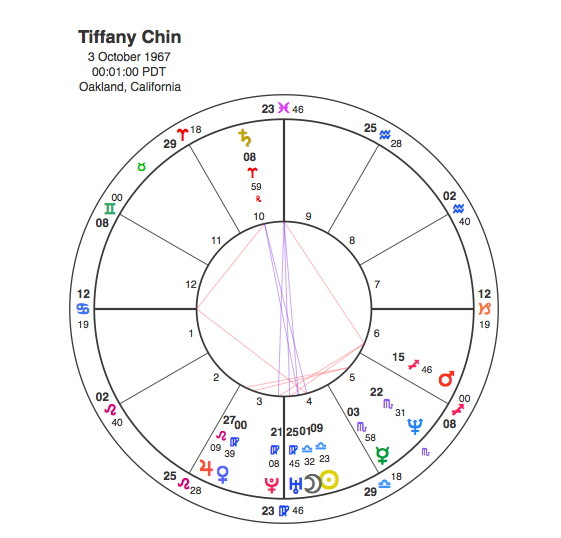 Obviously each situation is different and an investigation of the charts of all concerned would show the themes that are operating, but the birthchart of Tiffany Chin, the American figure skater looks like an archetype for the talented child with an oppressive and demanding parent. Chin was an American figure skater, who started skating at eight and was the figure skating Junior World Champion within four years. In the Winter Olympics of 1984, she finished fourth and won the Bronze at the 1986 Olympics. When she was 16 years old, she had a spin named after her, which was called “the Chin spin”. For someone so expert in a sport that is all about balance it is very fitting that Chin has the Sun and Moon at the beginning of Libra. This sign starts at the Autumn Equinox when the hours of daylight and night are equal. It is also exactly half way through the Zodiac which begins at the Spring Equinox, so Libra has always been associated with evenness and balance. Its symbol of the scales shows this and Libran characters are known for having great diplomatic and cooperative skills because of their need to live in perfect harmony with others. Anyone with the Sun and Moon in Libra would treat their sport as an art, so figure skating would be a perfect activity. The Sun and Moon are part of a multiple conjunction that includes Uranus and Pluto. The Moon rules youth and childhood and when it is conjoined with these planets the individual will experience enormous change in their young life. It also frequently comes up in the charts of people who are highly skilled in a particular area even to the point of genius. The Moon’s conjunction with Pluto can thrust them into the limelight at an early age as in the case of Miley Cyrus, Mozart and Melissa Sue Anderson. The fact that this conjunction occurs in the 4th house of family reinforces the idea of Tiffany Chin becoming famous at a young age, but it also points to the importance of her relationship with a parent and the impact that this has on her career. Someone can have incredible gifts that bring them great success but that doesn’t necessarily mean they will be happy. The Sun and Moon are opposite Saturn in the 10th house, a sure indication that Chin would feel oppressed by aspects of her career. A planet in the 10th will signify the main theme in the person’s career but it can also symbolise the influence of a particular person. Tiffany Chin’s career seems to have been largely driven by her mother, Marjorie who admits having demanding discipline on Chin in the areas of education and work habits on the ice. When Tiffany was 12, rumours were spread that her mother mistreated her, although there was no evidence. Anonymous telephone calls said Marjorie beat Chin, and threatened her with a knife. Saturn in the chart seems to describe Marjorie. Saturn is the teacher of self discipline and when it is opposite the Sun and Moon it can have a powerfully oppressive and stifling effect. Saturn is in Aries in the 10th house so Marjorie is driven by a powerful ambition ( Aries ) for her daughter’s career ( 10th house ). Tiffany Chin’s watershed Pluto moment was when it transited to conjunct her Sun in 1975 and she started skating at the age of 8. This was the only Pluto transit in her life to date but it is interesting to have a look at a couple of others. In 1985, Neptune was square her Moon. Neptune’s difficult aspects by transit will often contribute to an undermining of the person’s career and a rather vague and unclear fashion. It was during this transit when her mother noticed a muscular imbalance and stopped her training for three months. It got to the point when she could not even cross her legs, let alone skate like a champion. It affected the muscles in her hips, knees, and ankles. That diminished her skating skills, and she spent a lot of time in therapy. Her mother’s tenacity almost certainly saved her daughter’s career but at a considerable cost. Tiffany has claimed that she is desensitised, and does not believe it was worth the effort. After she won the National Championships in 1985, she decided to get away from her mom and become independent. Neptune went on to square the Sun in 1987 and when she thought she might not make the U.S. team for the Olympics, she announced her retirement from competitive skating, and signed a seven-figure contract with an ice show. Both Uranus and Saturn were square to her Moon in 1988 as she started an 18-month tour for $1 million as a special guest with the ice capades. Tiffany Chin’s skating career was dominated by her mother as is clear from her Sun and Moon in the 4th house opposite Saturn in the 10th. It is easy to have negative opinions about Marjorie’s role in her daughter’s career but its important to see that this was an essential part of Tiffany’s chart and therefore her destiny. Saturn is the principle of limitation, its role is to force the person to concentrate and work hard in order to achieve their goals. Many people apply their own Saturn in their lives. If the Sun and Moon were conjunct Saturn, the person would have the necessary self discipline to do this on their own. When Saturn is in opposition, the theme of restraint and focus and hard work will generally be forced on the person from outside. Tiffany Chin was talented but would not under her own steam have had the ability to concentrate and work at it. As a Sun / Moon Libra she would tend to be indecisive and often people with this sign strong appear to be lazy because they find it hard to focus on one particular direction. She needed an opposing planet in Aries to force her to make the most of her Libran skills. Marjorie was Tiffany’s Saturn, without her it is unlikely that she would have made it as a figure skater. However Saturn can be an oppressive figure to deal with and Tiffany’s response was to get away from the pressure of her mother’s input and also from competitive skating as soon as possible. The Moon in the 4th opposite Saturn in Aries in the 10th shows that the pushy ambitious parent has a role to play but in most cases of Saturn it doesn’t win them any popularity contests. But then Saturn isn’t that much bothered by negative reactions from other people, its used to it and it is very thick skinned. For Tiffany Chin, life with her mother pushing her from the sidelines must have felt like skating on thick ice.